Portrait of group of Carlisle Indian Industrial School students in uniform, 1894. Photo by John N. Choate. Photo Lot 81-12 06820900, National Anthropological Archives, Smithsonian Institution, Washington, D.C.
A Native American advocacy group says the U.S. government has failed in its responsibility to account for the fate of hundreds, perhaps thousands of children who died or disappeared into a historic boarding school system designed to “civilize” and Christianize generations of Native American children. Now, the group is hoping to take its case to the United Nations. Beginning in the 1870s, as part of its policy of forced assimilation of tribes, the U.S. government took hundreds of thousands of Native American and Alaska Native (AN/AN) children from their families and placed them in off-reservation boarding schools, a practice that continued until the 1970s. At these schools, usually run by religious institutions, children as young as four had to wear uniforms and could not wear their traditional clothing. They were given English names and punished harshly for speaking their native languages and practicing their religions. The schools provided only rudimentary education, and the children spent half their days laboring in school kitchens, laundries or farms. Many were sent out as domestic workers or farm laborers, making them even more vulnerable to abuse and exploitation. A 1928 study by what is today the Brookings Institution described crowded, unsanitary living conditions in most schools, noting that poor diets and chronic fatigue helped spread infectious diseases that ended up killing many. But just how many, no one is sure, said researcher Preston McBride, who has spent years researching the children's fates. “It’s really impossible to know because the files in the National Archives in Washington, D.C., which are our best source of information, are notoriously inconsistent, and documents are also scattered in various archives across the country,” McBride said. • An accounting of the fate all students and, if deceased, where they were buried. Government agencies are required to complete FOIA requests within 20 business days. Given the scope of the request, the BIE told NABS that it would need an additional 10 days to track down the documents. It also said that the bureau “could not fulfill under FOIA” the request for information on deceased students. When VOA searched for the FOIA requests online, it found the case marked “closed,” and contacted the BIE to ask why. A BIE -FOIA liaison said the bureau had gathered nearly 200 pages of documents pertaining to 186 schools, most of it financial in nature. He could not explain why these had never been released to NABS, but said he would mail copies of the documents both to NABS and VOA. 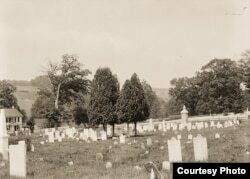 Cemetery on Carlisle Indian Industrial School grounds, 1879. Photo by John N. Choate, Photo Lot 81-12 06862200, National Anthropological Archives, Smithsonian Institution, Washington, D.C.
McCleave said the explanation is unacceptable. “They can’t just say, ‘Oh, sorry, we don’t do research.' This was U.S. federal policy and it has impacts in Indian Country today that the government is responsible for,” she said, citing poverty, violence and higher than average rates of alcoholism and disease, which she suggests have roots in historical trauma. NABS is currently working with the International Indian Treaty Council and the Native American Rights Fund to gather personal stories from relatives of boarding school children who died or disappeared. It will present them to the U.N. Working Group on Enforced or Involuntary Disappearances when it convenes in September 2018. “Under the International Convention for the Protection of All Persons from Enforced Disappearance, if the person is still missing and their whereabouts are still unknown, then it’s considered an ongoing crime against humanity,” McCleave explained. She said she hopes the Working Group will put added pressure on the U.S. government to fully account for the schoolchildren. Meanwhile, BIE tells VOA it has requested additional records from American Indian Records Repository, a government storage facility in Kansas, but cannot say when those might become available.